This is a very last minute cooking class that Chef Nancy Longo is doing this Saturday, January 29th at Pierpoint Restaurant. Chef Longo has been offering hands on cooking classes way before all these Johnny come lately cooking classes. 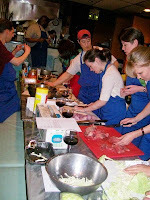 She’s quite the experienced teacher, the class is full value for the dollar and Chef Longo will make the class entertaining as well as educational.